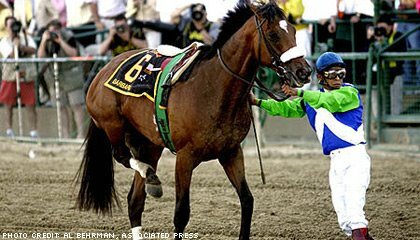 I’m sure that most of you have heard or read about Barbaro, the winner of the ridiculous Kentucky Derby that forces high-speed racing upon thoroughbred horses as a form of gambling and entertainment. As with much of the cruelty within the industry of non-human animal slavery, much of what happens is either ignored or unknown and it breaks my heart that this beautiful creature may continue to suffer, and surely die, without anyone really understanding how unnecessary his injury and death are. This horse will suffer and die as a result of greedy, apathetic, disconnected human indulgence, and there is nothing I can do about it. Barbaro represents so many other animals in the entertainment industry who suffer or die for absolutely no point but to make Humans laugh or make money. Beyond the obvious horrors of war, poverty, illness, and other troubles in our world, I find it more terrifying when something so devestating and insidious such as animal exploitation, slavery, abuse, and cruelty is met with such widespread apathy, active dismissal, and complete ignorance. I can’t save Barbaro, but I just wish for just one more person to care enough to stand as a form of intelligent rejection of such things as Horse Racing. It’s a start. Maybe you won’t give up eating animal bodies as a form of convenience, and maybe you won’t stop wearing their skins, but starting SOMEWHERE as a form of support for compassion beyond our species is a start at supporting peace in our world in a way you may never have considered. Think about it: If a person can wrap his or her mind and heart around the concept of caring enough for another species that his or her choices then take the shape of choosing compassion, peace, and kindness… it only makes sense that this same energy would affect our species and our world. And I don’t mean that in some metaphysical sense; I mean it literally. That “energy” is the impact of your choices, your behaviors, your thinking… and when those things are shaped by conscious compassion, it cannot help but change our world. Racehorses can cost millions of dollars and are often purchased by syndicates, which may be composed of thousands of members. (3,4) There are also trainers, handlers, veterinarians, and jockeys involved, so a horse is rarely able to develop any kind of bond with one person or with other horses. Racehorses travel from country to country, state to state, and racetrack to racetrack, so few horses are able to call one place “home.” Most do not end up in the well-publicized races but are instead trucked, shipped, or flown to the thousands of other races that take place all over the country every year. Horses begin training or are already racing when their skeletal systems are still growing and are unprepared to handle the pressures of running on a hard track at high speeds. (5) Improved medical treatment and technological advancements have done little to remedy the plight of the racehorse. One study on injuries at racetracks concluded that one horse in every 22 races suffered an injury that prevented him or her from finishing a race, while another estimates that 800 thoroughbreds die each year in North America because of injuries. (6) Strained tendons or hairline fractures can be tough for veterinarians to diagnose, and the damage may go from minor to irreversible at the next race or workout. Horses do not handle surgery well, as they tend to be disoriented when coming out of anesthesia, and they may fight casts or slings, possibly causing further injury. Many are euthanized in order to save the owners further veterinary fees and other expenses on horses who can’t race again. “Finding an American racehorse trained on the traditional hay, oats, and water probably would be impossible,” commented one reporter. (12) Many racehorses become addicted to drugs when their trainers and even veterinarians give them drugs to keep them on the track when they shouldn’t be racing. Few racehorses are retired to pastures for pampering and visits from caring individuals. In a commentary on the racing industry, a reporter for the Philadelphia Daily News remarked, “It is not something they talk about much in their advertising, but horses die in this sport all the time—every day, every single day.”(33) Help phase out this exploitative “sport”: Refuse to patronize existing tracks, work to ensure that racing regulations are reformed and enforced, lobby against the construction of new tracks, and educate your friends and family members about the tragic lives that racehorses lead. 1) Ted Miller, “Six Recent Horse Deaths at Emerald Downs Spark Concern,” Seattle Post-Intelligencer 8 May 2001. 2) Bill Finley, “Sadly, No Way to Stop Deaths,” New York Daily News 10 Jun. 1993. 3) Sherry Ross, “Fans Are Buying In,” Daily News 1 Jun. 2003. 4) “The Odds Are You’ll Lose: Owning a Racehorse,” Financial Times 1 Feb. 2003. 5) Glenn Robertson Smith, “Why Racehorses Are Cracking Up,” The Age (Australia) 15 Nov. 2002. 7) Tim Reynolds, “Technology Can’t Prevent Horse Injuries,” The Lexington Herald-Leader 30 Aug. 2001. 8) Andrew Beyer, “A Beyer’s Guide for Racehorses,” The Washington Post 3 Jun. 2003. 9) William C. Rhoden, “An Unknown Filly Dies, and the Crowd Just Shrugs,” The New York Times 25 May 2006. 12) John Scheinman, “Horses, Drugs Are Racing’s Daily Double; No Uniform Policy in Industry,” The Washington Post 27 Apr. 2003. 13) Janet Patton, “HBPA Proposes Uniform Policy on Drugs in Racing; Horsemen’s Group Targets Maze of State Rules,” The Lexington Herald-Leader 17 Oct. 2001. 14) Max Watman, “So Far, So Good for Barbaro,” The New York Sun 21 May 2006. 16) Peat Bee, “Cut the Poppycock and Treat Drugs With Horse Sense,” The Guardian 13 Jan. 2003. 17) Alex Straus, “Dark Horses,” Maxim May 2002. 18) Tom Keyser, “Gill Is Still Permitted to Stable, Race Horses at Pimlico, Laurel,” The Baltimore Sun 6 Apr. 2003. 19) “Trainer, Vet Charged in Trotter’s Death,” Associated Press, 22 Apr. 2001. 21) Skip Hollandsworth, “The Killing of Alydar,” Texas Monthly Jun. 2001. 23) Barbara Bayer, “1986 Kentucky Derby Winner Ferdinand Believed to Have Been Slaughtered in Japan,” The Blood-Horse Magazine 26 Jul. 2003. 24) Allen G. Breed, “And What of the Spent Racehorse?” Associated Press, 25 Nov. 1999. 25) Food and Agriculture Organization of the United Nations, “Horsemeat Exports—Value,” 2004. 26) Food and Agriculture Organization of the United Nations, “Horsemeat Slaughtered/Prod Animals (Head),” 2005. 27) Josh Harkinson, “Horse Flesh: Texas Struggles With What to Do With Its Overabundance of Equus Caballus While Europeans Wait With Open Mouths,” Houston Press 13 Apr. 2006. 28) K. McGee et al., “Characterizations of Horses at Auctions and in Slaughter Plants,” Colorado State University Department of Animal Sciences, 2001. 29) Todd J. Gillman, “Judge Won’t Stop Slaughterhouses; Appeal Weighed,” The Dallas Morning News 14 Mar. 2006. 30) C.L. Stull, “Responses of Horses to Trailer Design, Duration, and Floor Area During Commercial Transportation to Slaughter,” Journal of Animal Science 77 (1999): 2925-33. 32) Kris Axtman, “Horse-Meat Sales Stir Texas Controversy,” Christian Science Monitor 28 Apr. 2003.33) Rich Hofmann, “Racing Brings Up the Rear in Safety,” Philadelphia Daily News 23 May 2006. We can stop this slaughter – let your representative know that you want to see HR 503 passed. If we spread the word, we can prevent Barbaro Burgers from ever hitting the marketplace! Sounds like a harsh reality, and it is!